Stop me if you’ve heard this one before . . .
Oh no! The ethnics are coming! Lock up your Diana memorial china set! 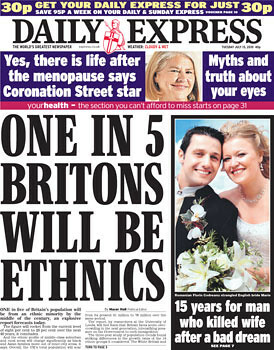 That's right, it's the tabloid's charming spin on the latest population projections. The rhetoric of the Express and the Mail could come from one of our own newsletters . . . But then they have to say, "Don't vote for those fascists!" It's ridiculous. › Will the coalition go to war with the banks?